The amount Americans owe on student loans has ballooned to over $1.4 trillion, more than 10% of total household debt owed. Chances are, even if you don’t owe money on student loans someone close to you does. So what do you do if you’ve managed to avoid racking up thousands in debt or have paid off your student loans but your partner hasn’t? Should you help him or her pay it off or should you let them tackle it on their own? Money is the number one cause of marital conflict and couples arguing about who owes what is becoming a topic that more are having to deal with. The answer may not be straight-forward or easy but it could save your relationship. For starters, you definitely wouldn’t want to help pay off the debt of someone you’ve only been dating for a few months. Regardless of your own financial situation, it just makes more sense for your own future and the health and balance of the relationship to wait until you see a future together before you start merging your finances. Let’s assume that you’re serious and maybe even married. Since couples take varied approaches to their finances even after they’re married, you’ll want to align your decision with the financial boundaries you’ve already set. Do you have joint or individual checking/savings accounts? Are you combining some of your money for mutual future goals or are those separate? If you’re going all in on your finances together with joint accounts then this may be an easy decision to help pay the debt off. But if you’re keeping everything separate or if you’re doing a combination of joint and individual accounts, then you’ll have to prioritize where paying off the debt lies in your goals together. How Much Do Student Loans Impact Your Future Goals? The next thing to consider is how the student loan debt impacts your mutual and individual goals. What would you be doing with the money if not putting it toward the student loans? Have you already set yourself up with an emergency fund, a retirement account, and anything else to make sure your own future is intact? If you have done all this and feel that this debt is impeding on your future together (i.e. for plans such as paying for a wedding or having children), then talk to your partner about helping them pay off their student loans to see if it makes sense for the both of you. Remember there is a possibility that your partner doesn’t want help and would rather pay off the loans on their own. If that’s the case, you need to respect those wishes. Try to understand your partner’s point of view because you don’t want them to develop an insecurity within the relationship due to debt. If your partner feels that you’re being judgmental for having the debt or trying to make them feel guilty about it, then you’ll have a hard time moving forward in discussions (and maybe even your relationship). If you decide that you’re not at a point in your relationship in which you’re ready to contribute financially, but still feel scared of your partner’s student loan debt, remember that there are other ways to help! If your partner is open to advice, why not sit down together and find a debt payoff strategy? Take a look at your partner’s budget and see if things can get moved around to better focus on the debt payoff. You could even talk about the possibility of your partner using his or her talents to earn extra money or to energize his or her career path and earning potential. Once you’ve gone over the budgeting and earning potential possibilities, look for other ways to cut down on interest due and loan repayment time. Automating biweekly payments on the loan are a great way to start! The way this works is your partner would sign up for biweekly payments, split the monthly payments into two, then pay them every other week instead of once a month. This is equivalent to one extra payment a year and can take years off the life of the loan without making a big impact on your partner’s monthly budget! You should also explore government programs like Income Based Repayment, look at consolidation, and even research if the lender gives a break on interest for loans in which the payments are automatically withdrawn. If your partner hasn’t yet refinanced their student loans, they may be able to cut down on interest payments and make the monthly bill easier to manage. Several peer-to-peer lenders like offer student loan refinancing. SoFi currently offers rates of between 3.4% to 6.7% on student loan refinancing for fixed rate loans and as low as 2.6% on variable rate refinancing. If your partner isn’t able to refinance their student loans at a better rate, they might consider a personal loan to pay it off altogether. P2P lender Upstart specializes in loans to recent grads with its unique lending model that takes into account more than just your credit score. The fact is, there are many ways to cut down on the life of student loans that many people don’t even know about. Helping your partner strategize alone will make a huge difference in this debt payoff! 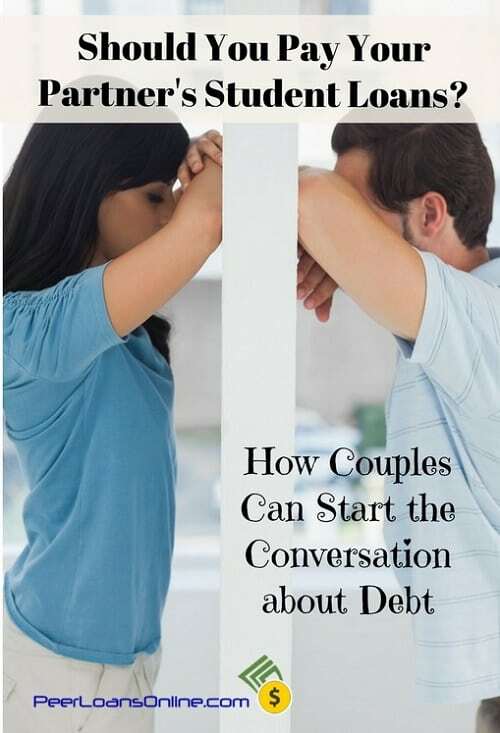 When it comes to dealing with debt as a couple, communication is absolutely essential. Debt may not drive a wedge between the two of you, but not communicating about it certainly can! Whether you ultimately decide to help your partner pay off their student loans or not, it’s a conversation you need to have. Those monthly payments probably aren’t going away anytime soon and they may even be going up. Don’t let student loans be a burden on your relationship. Start a dialogue with your partner and strengthen your bond together.